One 1.6kg mass was first plowed up in 1961 or 1962 and left under a fence until 1965. Another 6.5kg mass representing about two-thirds of an individual was found in a farm yard, Met. Bull. 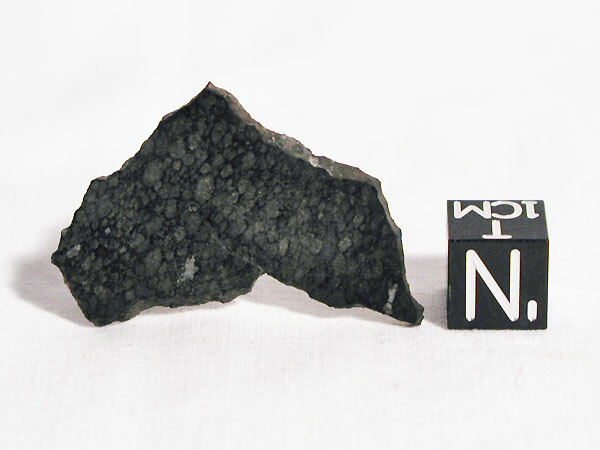 49, Meteoritics, 1970, 5, p.175; see also, K.Keil et al., Meteorite Research (ed. P.M.Millman), 1969, p.217. Classification, W.R.Van Schmus and J.M.Hayes, GCA, 1974, 38, p.47. Chemical analysis, 22.02% total Fe, T.S.McCarthy and L.H.Ahrens, Earth Planet. Sci. Lett., 1972, 14, p.97. Contains hibonite, K.Keil and L.H.Fuchs, Earth Planet. Sci. Lett., 1971, 12, p.184. Al-26 and Mn-53 data, M.Heimann et al., GCA, 1974, 38, p.217. Alkali element abundances, W.Nichiporuk and C.B.Moore, GCA, 1974, 38, p.1691. Chemical composition of matrix material, H.Y.McSween,Jr., GCA, 1977, 41, p.1145. Yb content, M.T.McCulloch et al., GCA, 1977, 41, p.1703. Petrology and composition, relationship to other CV chondrites, reduced subgroup, olivine Fa6.4, pyroxene Fs2.8, H.Y.McSween,Jr., GCA, 1977, 41, p.1777. SEM study of fremdlinge, A.El Goresy et al., Proc. LPSC, 1978, 9, p.1279. Exposure age based on spallogenic Mn-53 content, P.Englert and W.Herr, GCA, 1978, 42, p.1635. Grain size distribution, T.V.V.King and E.A.King, Meteoritics, 1978, 13, p.47. Infrared photometry, albedo, JHK colors, M.Leake et al., Meteoritics, 1978, 13, p.101. Mg isotopic composition, references, J.C.Lorin et al., Meteoritics, 1978, 13, p.537 (abs.). Ti, Zr and Hf abundances, M.Shima, GCA, 1979, 43, p.353. Pd content, N.Mermelengas et al., GCA, , 43, p.747. Minor and trace element data of CAI, H.Palme and F.Wlotzka, Meteoritics, 1979, 14, p.508 (abs.). Magnetic properties, T.Nagata, Mem. Nat. Inst. Polar Res., Tokyo, 1979, (12), p.223. Mineralogy and Mg isotopic composition of type B2 CAIs, I.D.Hutcheon and I.M.Steele, LPSC, 1980, 11, p.496 (abs.). Noble gas contents of bulk and acid-resistant residues, J.Matsuda et al., GCA, 1980, 44, p.1861. Calculation of atmospheric ablation based on cosmic ray tracks and Ne isotopes, N.Bhandari et al., Nucl. Tracks, 1980, 4, p.213. Mg isotopic composition and mineral chemistry of secondary phases in type B CAIs, I.D.Hutcheon and R.C.Newton, LPSC, 1981, 12, p.491 (abs.). Ti isotopic composition of Ti-rich CAIs, F.R.Niederer et al., GCA, 1981, 45, p.1017. Trace element data, H.-J.Knab, GCA, 1981, 45, p.1563. Contains Ca-dialuminate in refractory inclusion, M.Christophe Michel-Levy et al., Earth Planet. Sci. Lett., 1982, 61, p.13. Al-26 and Mn-53 data, Ne-21 exposure ages, U.Herpers and P.Englert, J. Geophys. Res., 1983, 88 (suppl. ), p.B312. Mg-Al isotopic data, I.E.Hutcheon et al., Meteoritics, 1984, 19, p.244 (abs.). Absolute Ca isotopic abundances in refractory inclusions, F.R.Niederer and D.A.Papanastassiou, GCA, 1984, 48, p.1279. Ti isotopic data, S.Niemeyer, Geophys. Res. Lett., 1985, 12, 733. An accretionary breccia, containing CM-like xenoliths; mineralogy and chemical composition, A.Kracher et al., J. Geophys. Res., 1985, 90 (suppl. ), p.D123. Absolute Ti isotopic abundances in CAI and bulk rock, F.R.Niederer et al., GCA, 1985, 49, p.835; see also, LPSC, 1984, 15, p.609 (abs.). Abundances and isotopic compositions of C, H and N, J.F.Kerridge, GCA, 1985, 49, p.1707. Saturation magnetization data, magnetite content, M.Hyman and M.W.Rowe, Meteoritics, 1986, 21, p.1; see also, LPSC, 1983, 14, p.341 (abs.). Oxygen and silicon isotopic composition of refractory inclusions, R.N.Clayton et al., LPSC, 1986, 17, p.139 (abs.). Study of structural deformation, P.M.Cain et al., Earth Planet. Sci. Lett., 1986, 77, p.165; see also, LPSC, 1984, 15, p.116 (abs. ); J.Wright-Clark and C.G.Goles, LPSC, 1983, 14, p.863 (abs.). Ru isotopic composition of acid resistant residue, H.Poths et al., GCA, 1987, 51, p.1143. Analysis of opaque assemblages in CAIs, J.D.Blum et al., GCA, 1989, 53, p.543. Mg isotopic heterogeneity in plagioclase olivine inclusions, I.D.Hutcheon and G.J.Wasserburg, LPSC, 1990, 21, p.1138 (abs.). Si isotopes in SiC, J.Stone et al., LPSC, 1990, 21, p.1212 (abs.). Petrologic, oxygen isotopic, and bulk analysis data of dark clasts, C.A.Johnson et al., GCA, 1990, 54, p.819; see also, LPSC, 1989, 20, p.468 (abs.). Major and trace element compositions of refractory inclusions, X.-Y.Ming et al., GCA, 1990, 54, p.2121. Al-Mg isotopic data of type B CAI, C.Caillet et al., Meteoritics, 1991, 26, p.326 (abs. ); LPSC, 1991, 22, p.167 (abs.). REE distribution in compact type A CAIs, A.K.Kennedy et al., LPSC, 1991, 22, p.709 (abs.). Petrography of refractory inclusions, S.B.Simon and L.Grossman, LPSC, 1991, 22, p.1261 (abs.). Chemical composition of refractory inclusions, P.J.Sylvester and L.Grossman, LPSC, 1991, 22, p.1369 (abs.). Study of deformation texture, T.Nakamura et al., Meteoritics, 1991, 26, p.377 (abs. ); see also, Papers 15th Symp. Ant. Met., NIPR Tokyo, 1990, p.31 (abs.). Magnetic properties, T.Nagata et al., Papers 15th Symp. Ant. Met., NIPR Tokyo, 1990, p.56 (abs.). Composition of olivine and chromite in type II chondrules, C.A.Johnson and M.Prinz, GCA, 1991, 55, p.893. Study of opaque assembladges in CAIs, evidence for low-temperature exsolution; occurence of goldmanite reported, S.B.Simon and L.Grossman, Earth Planet. Sci. Lett., 1992, 110, p.67. Geometrical analysis of microfaulting of CAIs and chondrules, A.Ruzicka and W.V.Boynton, LPSC, 1992, 23, p.1191 (abs.). Composition study of a wollastonite-bearing CAI, L.V.Caillet et al., Meteoritics, 1992, 27, p.208 (abs.). Major and trace element analyses of unusual CAI, P.J.Sylvester et al., GCA, 1992, 56, p.1343. Shock classification, E.R.D.Scott et al., GCA, 1992, 56, p.4281. TEM study of shock effects, T.Nakamura et al., Earth Planet. Sci. Lett., 1992, 114, p.159. Th-U abundances, A.Rocholl and K.P.Jochum, Earth Planet. Sci. Lett., 1993, 117, p.265. Carbon and Si isotopic composition of presolar SiC, C.M.O'D.Alexander, GCA, 1993, 57, p.2869. Major and trace element compositions of CAIs, differences between CAI types, P.J.Sylvester et al., GCA, 1993, 57, p.3763. Petrologic and Mg isotopic study of type B CAIs, C.Caillet et al., GCA, 1993, 57, p.4725. High-temperature shock experiments, T.Nakamura et al., LPSC, 1994, 25, p.969 (abs.). Noble gas composition of high-purity separates of presolar diamonds, G.R.Huss and R.S.Lewis, Meteoritics, 1994, 29, p.791. Noble gas analyses of acid-resistant residue, diamond and SiC contents, G.R.Huss and R.S.Lewis, GCA, 1995, 59, p.115. Potassium isotopic composition, M.Humayun and R.N.Clayton, GCA, 1995, 59, p.2131. 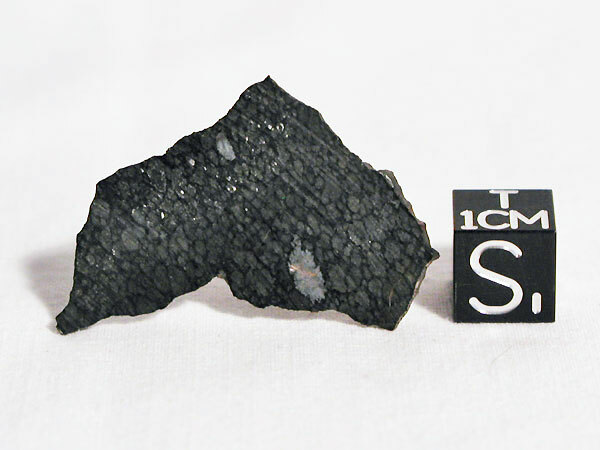 TL properties indicate a petrologic type 3.0, R.K.Guimon et al., Meteoritics, 1995, 30, p.704. Study of mineralogical alteration features, A.N.Krot et al., Meteoritics, 1995, 30, p.748. Petrological study of chondrule alteration, M.Kimura and Y.Ikeda, Papers 21st Symp. Ant. Met., NIPR Tokyo, 1996, p.68 (abs.). Analysis of P1 noble gases in acid residues by stepped pyrolysis, G.R.Huss et al., GCA, 1996, 60, p.3311. Oxygen, Mg, Si, Ca and Ti isotopic composition and REE pattern of "White Angel" refractory inclusion, C.Caillet et al., LPSC, 1997, 28, p.199 (abs.). Cosmic-ray exposure age, P.Scherer et al., MAPS, 1997, 32, p.A115 (abs.). Porosity and liquid permeability, C.M.Corrigan et al., MAPS, 1997, 32, p.509. TEM study of matrix mineralogy, L.P.Keller, Workshop on Modification of Chondritic Materials, LPI Tech. Rpt. 97-02, Part 1, 1997, p.31 (abs.). Petrology, composition and origin of secondary Ca-Fe-rich minerals, A.N.Krot et al., MAPS, 1998, 33, p.623. Mineralogical and petrographic study of alteration minerals in chondrules and matrix, A.N.Krot et al., MAPS, 1998, 33, p.1065. Petrological study of fayalitic olivine in chondrite matrix, M.K.Weisberg and M.Prinz, MAPS, 1998, 33, p.1087. Minor element abundances in spinels from type B CAIs, H.C.Connolly,Jr. and D.S.Burnett, MAPS, 1999, 34, p.829. Analysis of chondrule and CAI size and abundance, C.May et al., LPSC, 1999, 30, abs. #1688. Oxygen isotopic composition, R.N.Clayton and T.K.Mayeda, GCA, 1999, 63, p.2089. Noble gas data, cosmic-ray exposure age, P.Scherer and L.Schultz, MAPS, 2000, 35, p.145. Mineralogy and petrography of amoeboid olivine aggregates, M.Komatsu et al., Papers 25th Symp. Ant. Met., NIPR Tokyo, 2000, p.56; see also, LPSC, 2000, 31, abs. #1511.; MAPS, 2001, 36, p.629. Microdistribution of Ne isotopes, N.Vogel et al., MAPS, 2000, 35, p.A165 (abs.). Major element chemical and isotopic compositions of refractory inclusions, L.Grossman et al., GCA, 2000, 64, p.2879. Oxygen isotopic composition of type A CAI, E.D.Young et al., LPSC, 2000, 31, abs. #1837. Re-Os isotopic systematics of CAIs, H.Becker et al., GCA, 2001, 65, p.3379. Abundance and distribution of refractory forsterite grains, A.Pack and H.Palme, MAPS, 2001, 36, p.A156 (abs). REE abundances and oxygen isotopic composition of CAIs, S.S.Russell et al., MAPS, 2001, 36, p.A179 (abs). Petrological study of plagioclase-rich chondrules, A.N.Krot et al., MAPS, 2002, 37, p.155. Ne and Ar isotopic composition of chondrules, N.Vogel et al., LPSC, 2002, 33, abs. #1312; see also, MAPS, 2001, 36, p.A216 (abs). HRTEM search for carrier phase Q, R.D.Vis et al., MAPS, 2002, 37, p.1391. Porosity and density, D.T.Britt and G.J.Consolmagno, MAPS, 2003, 38, p.1161. Li, Be and boron isotopic compositions in type B1 CAI, M.Chaussidon et al., LPSC, 2003, 34, abs. #1347. Petrography and oxygen isotopic composition of accretionary rims, M.Cosarinsky et al., MAPS, 2003, 38, No. 7 (Suppl. ), p.A64 (abs.). I-Xe dating of dark inclusions, O.V.Pravdivtseva et al., MAPS, 2003, 38, No. 7 (Suppl. ), p.A140 (abs. ); see also, C.M.Hohenberg et al., MAPS, 2003, 38, No. 7 (Suppl. ), p.A149 (abs.). Microdistribution of primordial Ne and Ar in fine-grained rims, matrices, and dark inclusions, N.Vogel et al., MAPS, 2003, 38, p.1399. Noble gases in chondrules, N.Vogel et al., MAPS, 2004, 39, p.117. Mineralogy, petrology, and bulk major element abundances in fine-grained, spinel-rich CAIs, A.N.Krot et al., MAPS, 2004, 39, p.1517. Petrologic subtype classification based on Raman spectroscopy of organic matter, L.Bonal et al., LPSC, 2004, 35, abs. #1562. Study of Mg isotope zonation in CAIs, J.I.Simon et al., LPSC, 2004, 35, abs. #1668. Mg isotopic composition of bulk CAIs; formation chronology, A.Galy et al., LPSC, 2004, 35, abs. #1790.